People have mined lead in the Peak District for thousands of years including the Romans, as evidenced by the discovery of several Roman pigs (blocks of lead) found in the area. Lead mining remained a major industry in the area until its decline the 1850’s. There had always been lead mining in and around Derbyshire and there were numerous mines in the area of Stoney Middleton Dale, many of which made use of existing caves. It is the limestone which provided for lead, the fissured rock, characteristic of limestone allowed rich deposits of minerals to be collected in these fissures and especially galena (lead ore). The romans were the first to fully exploit these rich deposits; their inscribed lead ingots found locally providing us the evidence. The Domesday Book of 1086 recorded the existence of various mines in the area demonstrating that lead mining and smelting was by then an established industry. All lead mined in the area was Crown property and under royal control and was known as the King’s Field. There were two administration areas in the Peak District ,the High and Low Peaks, and each was each further divided into liberties, which were based on parishes boundaries. 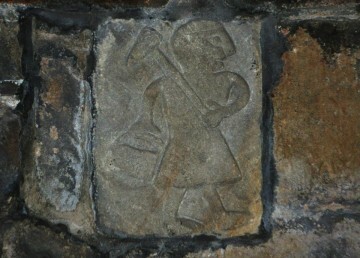 On one of the walls of a Derbyshire church is a crude stone carving, found nearby and placed in the church in the 1870s. Probably made in Anglo-Saxon times, it shows a miner carrying a kibble or basket in one hand and a pick in the other know as the T’owd Man as miners were know. 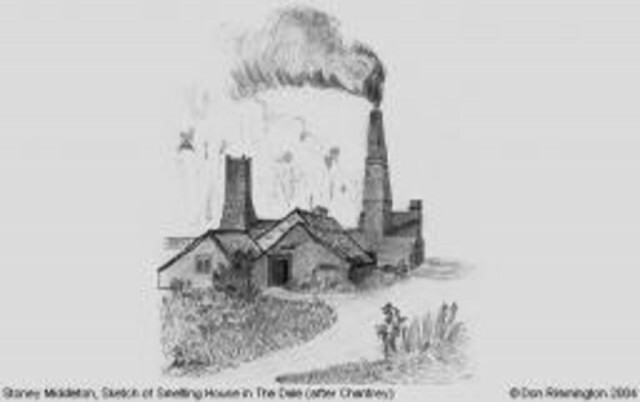 Derbyshire mining was a hard life for the early miners and whilst it made some rich for most it was simply a way of life with the hope of a lucky find which could make them rich and change their lives. It did however provide miners and their families a degree of independence but at a price. It was hard and dangerous work with the constant threat of injury from rock falls, gas, and flooding, along with the problems with breathing lead dust and in the late 17th century the hazards facing the miner increased, as they learned how to work with the gunpowder. However the risk didn’t stop lead miners continuing their plight for survival. The evidence we see today is extensive with thousands of hillocks and shafts, and miles of underground passages stand as a reminder of this extensive trade. A petition to King Charles provides further evidence to the extent of mining activities. Many thousand people are dailie imployed in the lead mynes, to the greatt proffitt of your Majestie … and to the whole Comonwealth … in getting greatt quantities of lead for the use of the Kingdome in generall, and in transporting the rest to forraigne Nations…. With the exception of wool lead was the most important contributor to the national economy of 17th century Britain. It was essential in the construction of homes which were being built at the time, it provided a roofing material, water storage tanks and piping and especially for the glazed windows which were now part of every building constructed. Glass could only be made in small sections and without the lead to join the pieces into larger glazing panels there would have been no windows. Lead was essential for the army providing the only material for ammunition. Such was its importance it became a major export material and was shipped all over the world. It was areas like Stoney Middleton that had become essential suppliers of lead ore. Early lead mining was a simple and crude affair; surface evidence of a lead vein would be simply followed underground until it ran out. However as these deposits ran out it became necessary to explore for possible deposits much deeper. Surface evidence would be sought by observing the ground vegetation and growth of trees which would be less evident in a lead rich area it being poisonous to plant life, they would probe under the surface looking for further signs. Eventually a site would be located which provided evidence of lead and a shaft would be sunk (dug). Shafts were sunk up to 90 feet (27 meters) deep; where greater depth was required the next shaft would be a few feet away from the preceding one. Wooden steps would be built into the sides of the shafts providing the precarious means by which the miners accessed and exited the mine. Miners often built a small stone cabin (coe) over the shaft to house their tools and spare clothing. Where the deposits were on a hillside miners would dive a tunnel into the slope to provide for easier access and removal of the ore.
Miners had only primitive tools which included little more than picks, hammers, wedges, and baskets for carrying the lead ore. The miners would avoid hard rock whenever possible and where not possible fires were often lit to heat up and fracture the rock, a process often aided by throwing water at the heated rock. Fire setting was strictly controlled and only allowed at night at the end of a working day. The ore would be picked away and dragged along the shaft bottom in sledges than hauled to the surface with a winding windlass. These primitive methods were improved upon over the years with the construction of simple wooden carriages and rails to transport the ore to the winding shaft. 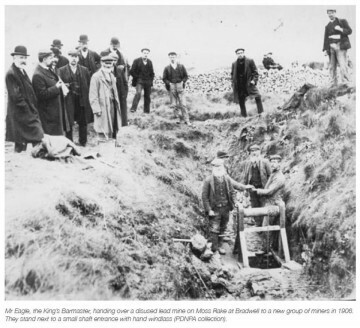 Early mining activities were usually abandoned when work reached the water table, however as time moved on miners learned how to drain their mines lowering the water table and therefore allowing deeper mining. A sough or drainage tunnel out to the nearest valley, and many of these were dug over the next century (Calver Sough for example). The brook in Stoney Middleton Dale starts from Watergrove Sough (below Furness Quarry). 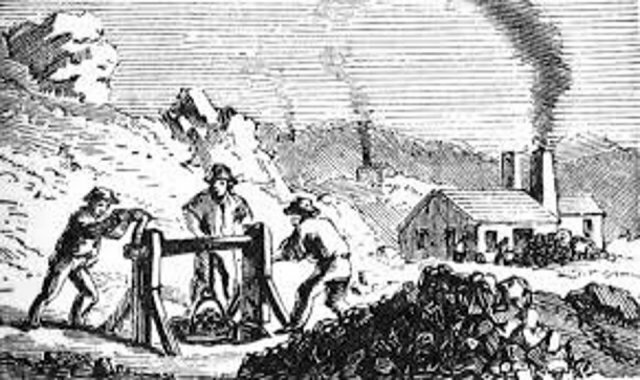 The lead at the surface required smelting to separate the lead from the ore. 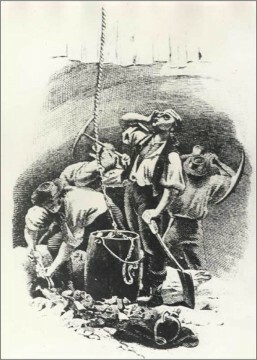 Early miners used very simple bole smelting methods. A fire would be lit in shallow dug out on the side of a steep slope. The bole would be filled with large pieces of ore and wood before being lit which could only be done when prevailing conditions were favourable. The bole required a good draft of air which was why they were positioned on a slope to encourage an updraft. The fires were left to burn for two days by which time the lead would have melted and run to the bottom of the bole. Stoney Middleton Dale provided an ideal location due to the sloping sides of the dale which would have had many boles along its length. Bole smelting was unpredictable and dependent on uncontrollable factors and by the late 16th century and boles with their wind power dependence were abandoned. The draft or blast was now provided by simple bellows to an ore hearth, initially operated by hand or foot providing control to heat the fire quickly to the desired temperature required to melt the lead. As time went on the process was further improved, mills were constructed to deal with larger smelts, the bellows increased in size and were now driven by water wheels, themselves powered by water from the brook flowing down the dale, again Stoney Middleton Dale provided well and at least two cupolas were built. The mills were fuelled by wood which was locally available. It was first dried in a kiln which improved burning and reduced the amount of smoke created, enabling the smelters to better observe the smelting process. This wood or white coal as it was known was used in the first furnace as this required only moderate heat to melt the lead which was run off and poured into moulds known as pigs. The slag from hearth was transferred to a second furnace which would use charcoal as a fuel as this was capable of reaching much higher temperatures which were needed to melt the lead and fully exploit the ore. The Dale brook was tapped off from the main flow and channelled at a slower rate of decent than the slope of the dale, it therefore gained height over the surrounding ground, height used to power a wheel driven by the force of the water falling onto its paddles. The wheel in turn provided power to drive two large bellows providing the draft (blast) oft air which increased the burn and in turn the temperature of the furnace. The monarch at the time claimed all mineral rights for the land on which lead ore was mined. This enabled the Duchy of Lancaster to collect the king’s royalties, these royalties were farmed out and miners paid them to the king’s farmer. By the 17th century the holder of the mineral rights was the barmaster, who ran the industry, helped by deputies responsible for the liberties. It was the mineral rights that drove the royal wish to maximise lead mining and from that two principals were established. Whilst the millers offered significant advantages over the previous smelting boles, they still encountered some difficulties. The hearths soon burned out and were constantly in need of repair, whilst the polluting fumes made it necessary to close down the smelter at the end of each working day. The mills were restricted to riverside locations and required large quantities of wood. The answer was the Cupola which gradually replaced the mills. The cupola was a reverberating furnace which allowed fuel to be burned at one end of a low domed shaped combustion chamber. A large tall chimney was located at the other end of the chamber providing a powerful draught drawing flames and hot gases across the roof of the chamber. The ore was placed under the domed roof and super heated by the reverberating action of the dome roof, forcing heat down onto the ore. The slag was skimmed of the top of the moulton lead before it was run off and ladled into pigs. After the 18th century the lead industry declined due to cheaper imports from abroad, and while this was moderated by import duties their abolition in 1845 saw the beginning of the end for lead mining in Derbyshire. 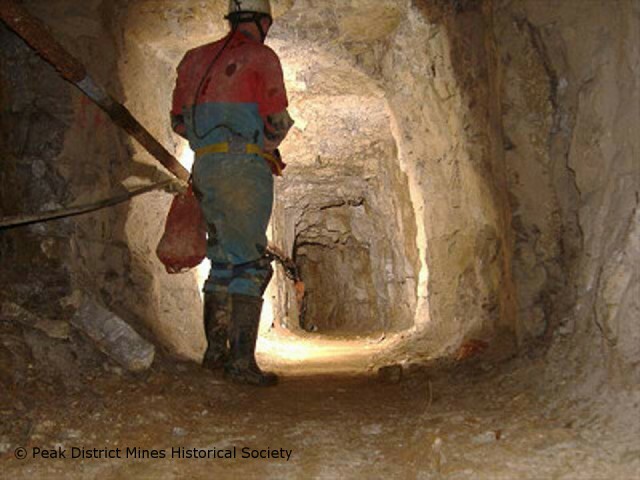 Learn more – Peak District Mining Museum located in Matlock Bath, Derbyshire the museum provides a vast array of artifacts and information on lead mining in Derbyshire and is well worth a visit.